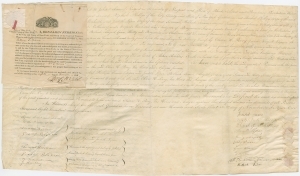 Elaborate receipt for Newport, Rhode Island sale of land from estate of Benjamin Seixas (1747-1817) signed by numerous members of his family and members of the Spanish-Portuguese Jewish Congregation who were heirs to the property, known now as the Buliod-Perry House at 29 Touro Street, to Commodore Oliver Hazard Perry, the great naval hero of the Battle of Lake Erie in 1813. [EARLY AMERICAN JUDAICA]. NAPHTALI PHILLIPS. 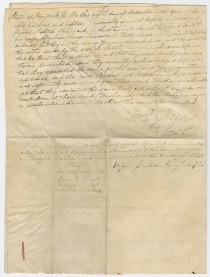 Manuscript Document Signed, 1p, folio, 14½ x 21½ in., November 30, 1818. Jachebed Seixas (1746-1828), wife of Moses Mendes Mendes. Naphtali Phillips (1773-1870). In 1796, Phillips took the first copy of George Washington’s farewell address that came off the press of the American Advertiser, a leading Philadelphia newspaper. (In 1848 this document was placed in the cornerstone of the Washington Monument.) On July 5, 1797, Phillips married Rachel Hannah, daughter of Moses Mendez Seixas, a prominent Newport merchant and banker and a brother of Gershom Mendez Seixas, known as “the patriotic Jewish minister of the American Revolution.” Phillips was elected the first American born parnass of Mikveh Israel at the age of 25; he also helped to draft the new constitution of the synagogue. He soon returned to New York where he became parnass (president) of Shearith Israel, the Spanish and Portuguese Synagogue by 1816, and served for 14 terms. He was prominent in the affairs of the Democratic Party in New York City. Rachel Phillips (1798-1861), daughter of Benjamin M. Seixas; wife of Naphtali Phillips. Samuel Lopez, probably the son of David Lopez (died, 1822). Judy (Judith) Lopez, wife of Samuel Lopez. Abby Seixas (1784-1860), the second child of Benjamin Seixas to be named Abigail (the first died in 1782). Grace Seixas (1794-1866), daughter of Benjamin M. Seixas. Married Jacob I. Cohen. Hetty Seixas (1789-1854), daughter of Benjamin Seixas. S.T. Northem, trustee for the Estate of Benjamin Seixas. Bilhah Seixas (1781-1860), daughter of Benjamin Seixas. To the left bottom are signatures of witnesses to those of the Seixas family children and relatives who signed on the right bottom side. Attached to the top of the Seixas document is a separate document with the seal of the New York mayor’s office guaranteeing the handwriting and signature of a New York Commissioner, William L. Morris, who has recorded the instrument of property transfer. Commodore Oliver Hazard Perry (1785-1819) was an American naval commander, the older brother of Commodore Matthew C. Perry. Perry served in the West Indies during the Quasi War of 1798-1800 against France, in the Mediterranean during the Barbary Wars of 1801-1815, and in the Caribbean fighting piracy and the slave trade; but he is most remembered for his heroic role in the War of 1812 during the 1813 Battle of Lake Erie. Supervising the building of a fleet at Erie, Pennsylvania against the British he earned the title, “Hero of Lake Erie” for leading the American forces in a decisive victory at the Battle of Lake Erie for which he received a gold medal from Congress. His leadership materially aided the successful outcomes of all nine Lake Erie military campaign victories and the victory was the turning point in the battle for the West in the War. His famous words, “Don’t Give Up the Ship” were emblazoned on his battle flag, and his message to General William Henry Harrison; “We have met the enemy and they are ours…” are two of the most famous military quotes in American history. Perry bought the property at 29 Touro Street, delineated in this document, with the idea of eventually retiring there. Unfortunately, in 1819 while commanding the frigate John Adams sailing for the Oronoco River in Venezuela in an attempt to once again discourage piracy in the Americas, he contracted yellow fever and died on August 24th, 1819, on his 34th birthday. His family continued to occupy the Newport property until 1865 when it became headquarters for a naval training ship aptly named, the Oliver Hazard Perry. His body was brought back to Newport and he was buried in the Island Cemetery, where his brother, Matthew C. Perry is also interred. A most important unique and historic Newport document linking one of America’s greatest naval heroes and a major Jewish American family. The Story of the Jews Of Newport… By Morris A. Gutstein; New York, Bloch Publishing Company, 1936. The History of the Jews of Philadelphia… Edwin Wolf 2nd and Maxwell Whiteman, Philadelphia, The Jewish Publication Society of America, 1956 and 1975. “Know all men by these Presents that Jachebed Seixas of Newport in the County of Newport and State of Rhode Island and Providence Plantations Widow and Devisee of Moses Seixas late of said Newport deceased, Naphtali Phillips of the City, County, and State of New York Gentleman and Rachel Phillips wife of said Naphtali, Samuel Lopez of said New York, Merchant, and Judith Lopez wife of the said Samuel, Bilhah Seixas, Abigail Seixas, Grace Seixas, & Hetty Seixas all of said Newport single women, and Stephen T. Northem of said Newport, Merchant and Assignee of Benjamin Seixas of said Newport Gentleman in trust for the Creditors of the said Benjamin, which said Rachel, Judith, Bilhah, Abigail, Grace, Hetty, and Benjamin are Children and Devisees of the said Moses Seixas; For and in Consideration of the sum of Four Thousand One hundred Dollars, to us in hand well and truly paid before the unsealing and delivery hereof by OLIVER H. PERRY of said Newport, Esquire, the receipt whereof we do acknowledge, have given, granted, bargained, sold, conveyed and confirmed, and by these Presents, do give, grant bargain, sell, convey, and confirm unto him the said OLIVER H. PERRY his Heirs and Assigns forever, a certain Lot of Land situate in said Newport, with the Dwellings, house, and other buildings thereon standing, bounded North on Washington Square East on a gangway and on land of Asher Robbins: South on land late of Jonathan Marsh deceased, and West on land late of Isaac Senter deceased, being the same Estate on which the said Moses Seixas in his lifetime resided. To have and to hold the said granted Premises with the privileges and appertenances thereto belonging to him the said Oliver H. Perry his Heirs and Assigns forever. And the said Naphtali Phillips and Rachel Phillips, Samuel Lopez and Judith Lopez, Bilhah Seixas, Abigail Seixas, Grace Seixas, and Hetty Seixas for ourselves, our Heirs, Executors, and Administrators do hereby Covenant to and with the said Oliver H. Perry, his Heirs and Assigns that at and before the enscaling and delivery hereof, the said Rachel, Judith, Bilhah, Abigail, Grace, and Hetty, are lawfully seized and possessed of six individual seve(n)th parts of the said granted and described Premises in their own Right, as of an Estate of Inheritance fee simple in remander, that We have good right, full power and lawful authority to sell and convey the same to the said Oliver H. Perry to hold as aforesaid that We, our Heirs, Executors, and Administrators shall and will forever Warrant and Defend the said six seventh parts of the said granted and described Premises to him, the said Oliver H. Perry, his Heirs and Assigns against the lawful claims and demands of all Persons.